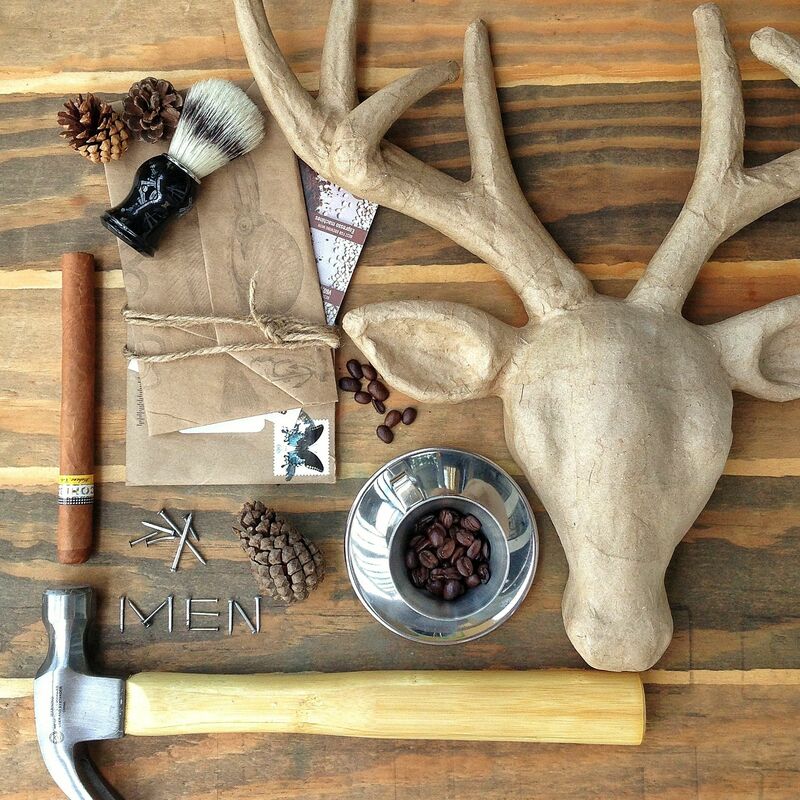 Some of the items used for this collage, including the deer head, are an excellent idea for gifts for Father’s day. I have to say that from all of the project I’ve done so far, this one has been the easiest one to make. With all the buzz that’s been around quite a while now about deer and animal heads as accents pieces in decoration; I knew it was time for me to hang mine. The revelation came while I was in Michael’s the other day looking for something for another project, when suddenly making an acute U-turn in one of the alleys, my eyes got struck by the sight of two beautiful carton deer head styles. The price was unbelievable, and the possibilities of crafting were endless. So, I grabbed one determined to hang it just as it was, anywhere in my home. But then I thought “what about paint it all white to make it look more porcelain-like?”. Not a bad idea at all. Just then I remembered that I’ve recently bought a gift wrapping paper at HomeGoods that resembled an old newspaper, and that this would be a great way to decorate the head. So now with hands full and head tumbling with ideas, I headed home. 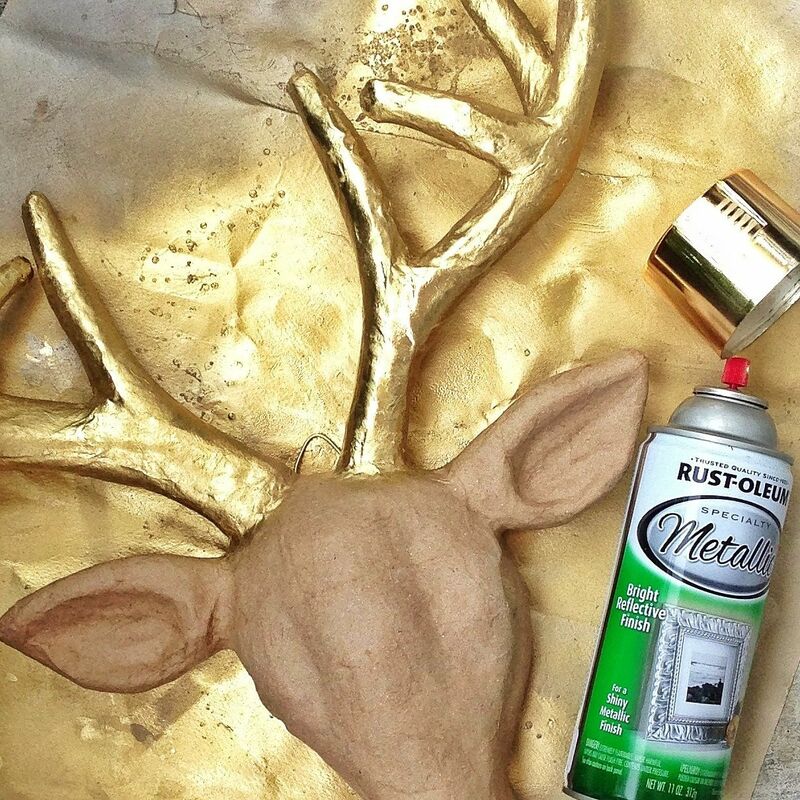 The first thing I did was to paint the deer antlers with a gold spray I had at home. I used for this project Rust-Oleum Specialty Metallic in gold from Home Depot, because It dries to the touch very fast and the shine it gives resembles the one of gold-leaf paper. 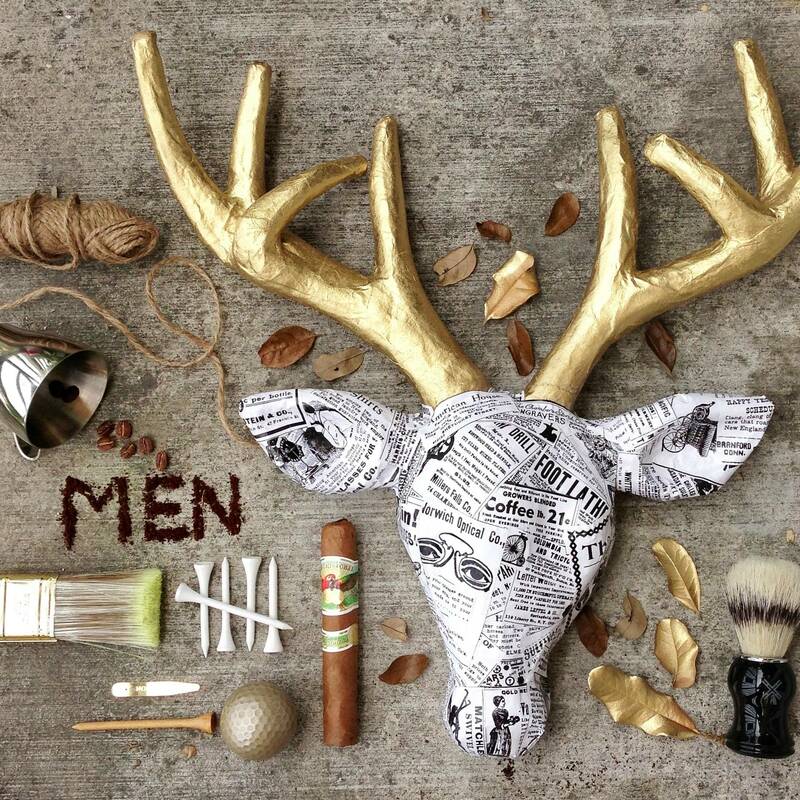 While those antlers were drying, I started cutting my gift wrapping paper. This paper was so nice and interesting because they were different 1800’s newspaper ads collage like the real thing back on those days. So I cut many in different sizes. I have to confess this task took some time but not because of the difficulty, it took time because I read each one of them. I found one that read “Coffee 21 cents the pound” wow! 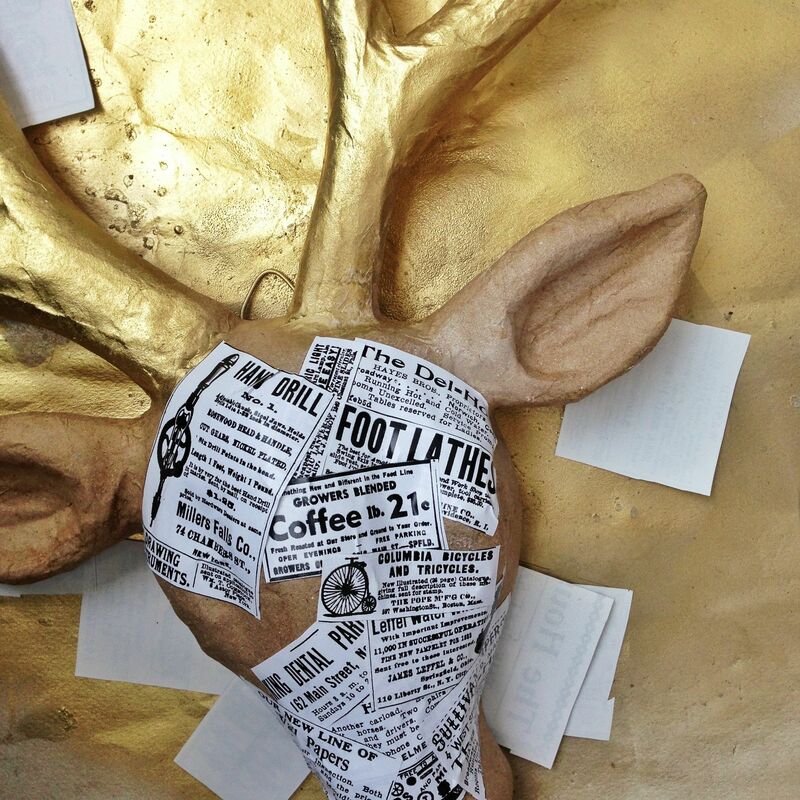 So after reading and cutting, I started to paste each of the ads in different positions to give this deer head an interesting look. I simply used spray paint for this task and I only glued the ads on the outside of the head, not inside. At the end of the project, I thought of giving a tint over the ads I just pasted to give them an old look. Though I didn’t do it, I know it would have given this little cardboard taxidermy a great final. Hope you’ve enjoyed this project. Throw me a comment to let me know. Where did you find the deer head? and where can I get one? I agree with Lauren, I've been looking for one of these FOREVER and I've never found one! Hello Lauren! I'm so happy to get to read your question. 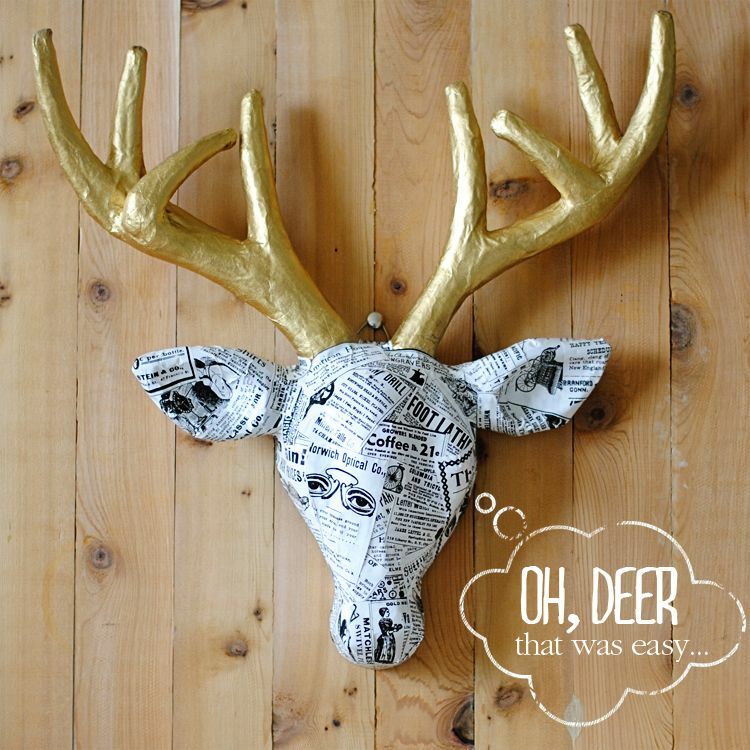 I found this deer head at Michael's (www.michaels.com. Hope this might help! Hi Cheyenne! I bought this particular deer head at Michaels Stores. Though, they do have a website (www.michaels.com), I did not see this head over there. Let me know if I can be of any other help. Thank you so much for posting. I love your blog…it is my new favorite. I'd love to know how you photograph your pictures. They are beautiful. Do you have a lighting setup or is it natural? Hello Funny Faces Photography! Sorry for the lateness of my message but with the changes on Gmail, did not see your feedback and for visiting my blog. 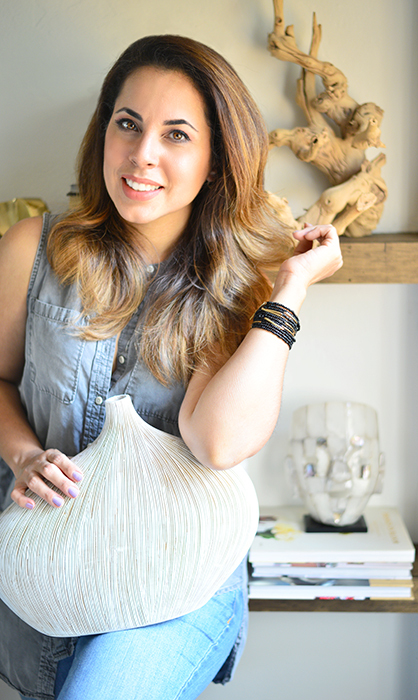 I don't use special lighting in my photos, besides natural light. I love taking photos early in the morning or just after 5 pm. The sun is just beautiful at those hours. Thank you very much for stopping by. Simply wish to say your article is as surprising. The clarity in your post is simply great and i could assume you are an expert on this subject. What kind of glue/spray did you use for the newspaper and how would you tint it to look older? I just bought a deer head at my local Michael's yesterday. I've been looking everywhere for the method of fastening the deer head to the wall. What kind of fastener did you use? I have one, and don't want to mount it on a plaque, but directly on the wall. I like the gold antlers on yours, by the way! Any suggestions about how to hang it up? Hello Joanne! If my memory doesn't fail me, I think my deer had already the hanger on the back. If not, you might want to try using one of those metal soda caps by fastening one of the side with a strong tape. Hope this helps.